Increased security for your personal information - no personally identifiable information is contained on the magnetic stripe or barcode. Unique Member Identifier -- Department of Defense assigns an electronic data interchange personal identifier (EDIPI) that allows VA to retrieve the Veteran’s health record. A salute to your military service – The emblem of your latest branch of service is displayed on your card. Several special awards will also be listed. The VHIC is issued only to Veterans who are enrolled in the VA health care system. The VHIC is for identification and check-in at VA appointments. It cannot be used as a credit card or an insurance card, and it does not authorize or pay for care at non-VA facilities. Veterans must be enrolled in the VA health care system to receive a VHIC. To enroll, you can complete an application for enrollment in VA health care by telephone without the need for a signed paper application. Just call 1-877-222-VETS (8387) Monday through Friday from 8 a.m. until 8 p.m. Eastern. You can also apply for VA healthcare benefits online at www.va.gov/healthbenefits/enroll, or in person at your local VA medical facility. Once your enrollment is verified, you can have your picture taken at your local VA medical center, and a VHIC will be mailed to you. To ensure a Veteran’s identity, enrollees must provide one form of primary identification when requesting a VHIC. Acceptable forms of primary identification are listed in the table below. Once you have your picture taken, you should receive your VHIC within 10 days. If you have questions about the status of your VHIC, you may call your local VA medical facility where you receive your care or contact us at 1-877-222-VETS (8387). VA wants all enrolled Veterans to have the VHIC, which is more secure and protects their personal information. If you have the old VIC, you should destroy it by cutting it up or shredding it. 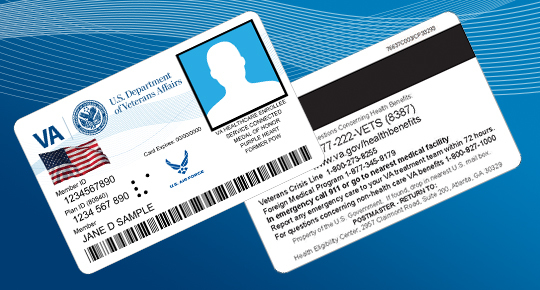 If your VHIC is lost or stolen, contact the VA medical facility where your picture was taken to request a new card be re-issued, or call 1-877-222-VETS (8387). Veterans will need to provide identification information, when reporting lost or stolen cards.